Steve Thomas, Texas State District Judge in Hardin County, has extended his temporary restraining order for 2 more weeks. This extension allows Students in Kountze ISD the ability to hold personally made signs at public school events, even if the signs have Bible Verses or religious encouragements. 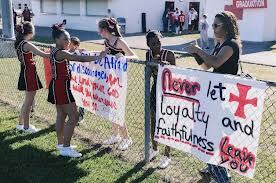 Judge Thomas had previously granted a temporary restraining order in favor of the cheerleaders who were banned from holding signs or banners at Football games if they contained anything religious on them. This extra extension was granted so that, before he makes his decision, Judge Thomas can thoroughly review documents submitted by both sides. The Liberty Institute's Mike Johnson, is representing the students. There was even a brief submitted to Judge Thomas from an influential Texas authority, Texas Attorney General Greg Abbott. Abbott took the side of the cheerleaders and said that State Law, the Texas Constitution, and past Court Rulings protect the religious rights of these kids. Abbott went even further to say that the Freedom from Religion Foundation (FFRF) was trying to just stir up trouble and has tried to do this in Texas before but has failed. Other Texas Republicans have stood up and expressed support for these students, including Congressman Steve Stockman, State Rep. James White, State Board of Education Member David Bradley, and Railroad Commissioner Barry Smitherman. Before Judge Thomas granted the extension on the restraining order Thursday, the Superintendent testified that he had acted on bad advice from the school lawyers in banning the signs. The Superintendent, Kevin Weldon, went on to say that he now believes that his decision banning these signs not only violates district policy, but also the rights of the students. There is a big RALLY Friday, Oct 5th 2012 7:30pm at the Kountze High School Football game in Kountze, TX. Come out to Support the Kountze Kids! There are thousands of people from all over expected to come to this game and hold signs supporting these students and their religious rights. This will be the first home game since the school district superintendent banned the cheerleaders from holding their signs. This restraining order allows students at this game to hold signs with Bible verses and other religious encouragements.